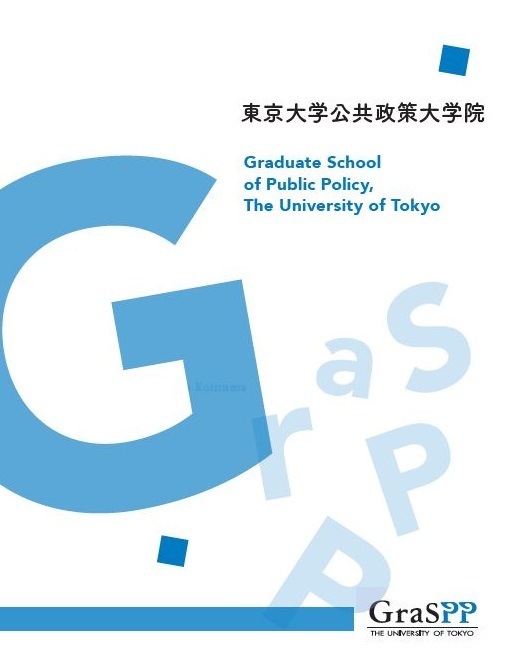 The University of Tokyo’s Graduate Schools for Law and Politics and Graduate School of Economics have co-established the Graduate School of Public Policy (GraSPP), which offers a Master of Public Policy (MPP) degree. GraSPP aims to train students in planning, implementing and evaluating public policy, and to prepare students for careers in public service. Many Faculty of Law and Faulty of Economics graduates have in the past become prominent government officials and influential politicians. While this tradition will likely continue, to effectively address modern-day challenges and an ever changing and more complicated Japanese societal structure, a new, innovative approach for preparing and educating future leaders is needed. In an era where Japan’s industrial structure is moving further towards a service oriented framework, its population ages and birth rate continues to decline, and globalization demands the creation of a new international financial architecture, institutions of higher education concerned with addressing these seismic shifts must adapt their approach to learning and scholarly pursuit. To this end, GraSPP’s MPP is specifically designed to address these and other issues of national, regional, and global concern. The program builds off of a two-pillared foundation, combining theory and practice to yield a holistic approach to understanding methods of evaluation, consensus building, policy formation and implementation. Our students graduate with a tool-set that meets the gold standard of contemporary education, ready and able to meaningfully contribute to their career of choice, whether it be in government, politics, mass media, or the broader private sector arena. Balanced training in law, politics, and economics, which serve as the core of policy planning, implementation, and evaluation. Practical learning based on courses, case studies, and lectures led by preeminent practitioners. GraSPP joins the ranks of other prestigious University of Tokyo professional schools, including the Law School and Medical School. While these are geared towards producing legal and medical professionals, GraSPP aims to graduate public policy professionals. GraSPP professors hail from the Graduate School of Economics and the Graduate School of Law faculties, and are widely recognized as thought-leaders in their respective fields. GraSPP faculty members are readily open to out-of-classroom collaboration and guidance with students; the MPP program prides itself on the accessibility of its faculty. A Master Degree in Public Policy will be granted upon completion of 46 credits within a minimum of 2 years. GraSPP admits approximately 110 students per academic year. GraSPP has six sub-specializations: Legal Policy, Public Management, International Public Policy, Economic Policy, Master of Public Policy, International Program (MPP/IP) and Campus Asia Course. A comprehensive admission exam is conducted. It consists of a written application, English proficiency test, written exam, and interview. Special consideration is given to admitting midcareer businesspeople. The administration offices of GraSPP are located in the International Academic Research Building of the University of Tokyo’s Hongo Campus. Classes are also conducted in this building, as well as in the Economics and Law School buildings. Study Halls, Lounge and lockers for GraSPP students are available in the Akamon General Research Building.